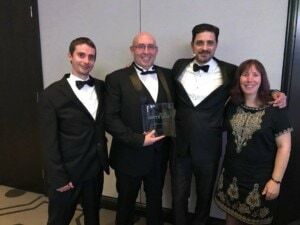 At a ceremony held on 23 November at the Hilton London Gatwick Airport, Lincad was announced the winner in the newly created Supply Chain category of the Insider’s Made in the South East Awards. Now in their fifth year, the awards are designed to recognise and reward manufacturing companies based in the South East that have demonstrated success in innovation, product development and growth in either domestic or overseas markets. The evening was compèred by presenter Alexis Conran, with Dr Sally Beken from Innovate UK giving a keynote speech. A UK leader in the design and manufacture of bespoke batteries, chargers and power management systems for military and other specialist applications, Lincad has formed partnerships across the supply chain, working closely not only with customers – including the UK MOD and defence contractors such as Leonardo, BAE Systems, Thales and Northrop Grumman – but also with key suppliers, particularly the major global cell manufacturers. As a result of winning this award, Lincad has now been automatically shortlisted for the national awards final, Made in the UK 2018.